Red and black are two colors that mean completely different things. Red is associated with love and passion. Black is associated with death and darkness. Yet, when the two colors are put together in one outfit, they compliment each other phenomenally. This young lady used black items to bolster her bright red dress. The black leggings give a strong contrast to the lower half of the dress, whereas the black motorcycle jacket helps to narrow and emphasize the top of the dress. 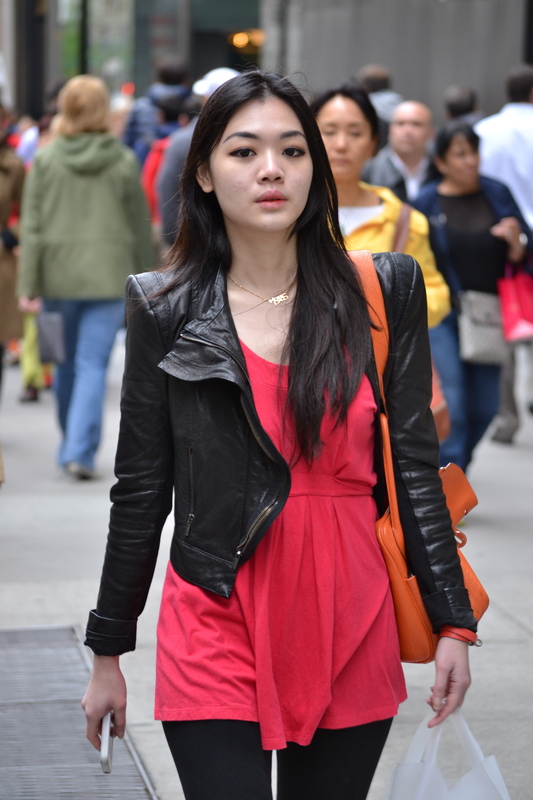 The orange handbag is a great addition of a bright color, but does not take away from the red dress. Here, this girl flipped the outfit around and used red as an accent. Her black boots, skirt and overcoat are fine for the rainy day it was, but to add some life to her outfit, she added red leggings. They play really well, creating a strong accent, and breaking up an all black outfit. A definite eye-catcher. Posted on April 27, 2012 by Capture the Streets	This entry was posted in Fashion From the Streets and tagged Beauty, fashion, New York City, photography, style, Women's Fashion. Bookmark the permalink.